PT470 wireless body-pack transmitter. Requires single AA battery. Mini 3 pin XLR socket output. HT 470 wireless hand held transmitter. Requires single AA battery. HT 450 wireless hand held transmitter. Requires single AA battery. PT450 wireless body-pack transmitter. Requires single AA battery. 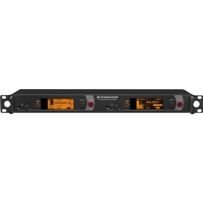 UR4D dual channel diversity receiver. 75MHz frequency range. Hand held and beltpack transmitters parameters maybe selected on the receiver and synchonised via infra red transmission. Supports cascading antenna distribution. Frequency and power off lock out in settings. TA4M 4 pin XLR socket output. UR2 wireless hand held transmitter. Requires x 2 AA battery. Compatible with Shure interchangable capsules. 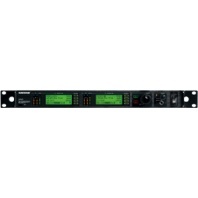 EM2050 dual channel diversity receiver. 75MHz frequency range. Hand held and beltpack transmitters parameters maybe selected on the receiver and synchonised via infra red transmission. Supports cascading antenna distribution. 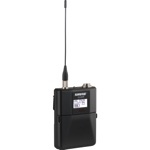 SKM2000 wireless hand held transmitter. Requires x 2 AA battery. Compatible with Sennheiser interchangable capsules. Frequency and power lock out in settings. PS4000W active wideband antenna splitter/distributer. 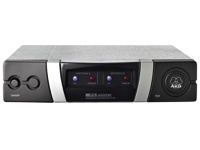 Diversity distribution for up to 4 receivers plus cascade link-out to feed additional distributer units. Has DIP switch facility to attenuate RF output, power receivers over antenna cable. WD-4800 active wideband antenna splitter/distributer. Diversity distribution for up to 4 receivers plus cascade link-out to feed additional distributer units. Passive circular polarised directional UHF antenna for transmitting and receiving. Type N connector socket. 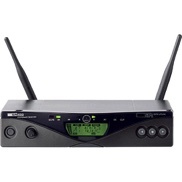 ULXDQ4 quad channel digital radio microphone receiver. 64MHz tuning frequency range. AES256-bit encryption enabled. Hand held and beltpack transmitters parameters maybe selected on the receiver and synchonised via infra red transmission. Supports cascading antenna distribution. ULXD2 wireless hand held transmitter. Requires x 2 AA battery. Frequency and power off lock out in settings. AES 256- bit encryption enabled.